Click the button below to add the TD Wabbit Season Collection to your wish list. Camo Acrylic Designer Kit for Serious Nail Techs! Nail Technicians and Students are using our acrylic nail kits to create acrylic nail art and amazing acrylic nail designs while saving time. Each jar of Designer Acrylic Powder gives you a minimum of 25 SETS of Nails or 250 nail designs. One Kit will do 1500 nail designs! Let us do the work for you! We mix the color, you make it amaZing!! 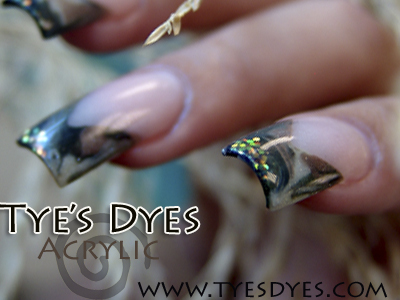 Ready to go camo, all you need is your Nail Tech Ammo!Acrylic Nails with Tye's Dyes pre-mixed powders. 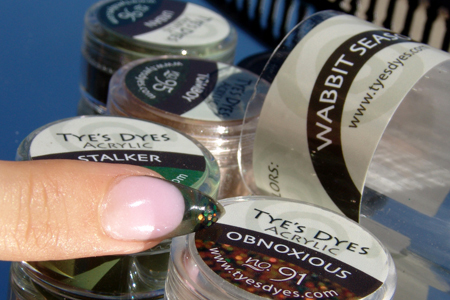 We make doing nails easy, Colors are set and ready, just open the jar and fire away. Everytime I order a product from these guys I'm pleasantly surprised by how fast I get it and how great the product is! Not to mention I usually see a free-be to try out as well! Awesome stuff and service! I love this color line!